Flags on the Colonnade in honor of the lives lost on September 11, 2001. 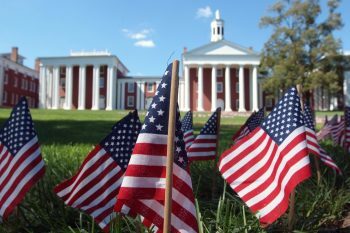 The W&L community remembers today those whose lives were lost 16 years ago on September 11, 2001. 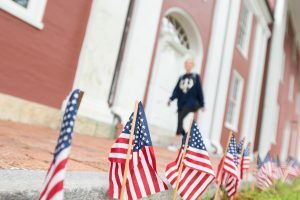 Those losses include two members of the Washington and Lee family — Rob Schlegel, of the Class of 1985, who died in the Pentagon, and James Gadiel, of the Class of 2000, who died in the World Trade Center. Rob was on the staff of the chief of naval operations at the Pentagon and had been promoted to commander just weeks prior to the attack. James worked in the equities department of Cantor Fitzgerald, on the 103rd floor of the north tower of the World Trade Center.